Is there enough business to keep the 3 leaders alive? 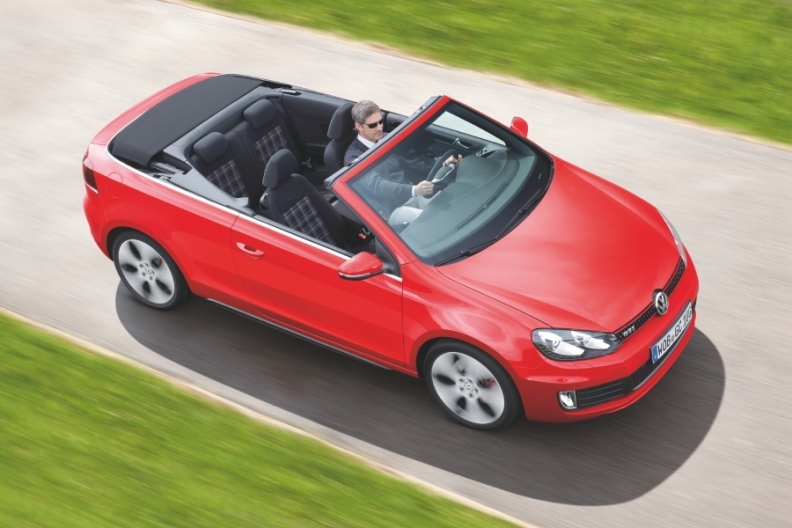 Webasto's two major launches this year are the Mini roadster and the VW Golf GTI Cabriolet (shown), but the supplier sees even greater potential for panoramic sunroofs. After a round of bankruptcies and buyouts, the world of roof system suppliers has narrowed to three major players: Webasto Roof Systems, Magna Car Top Systems and Valmet Automotive. With convertible production in Europe and North America stuck at recessionary levels, it is unclear whether all three can make much money in this segment. "Is there enough business? That is the question," Webasto CEO Erik Roeren told Automotive News Europe. "I'm optimistic that the market will come back, and I believe the automakers need three suppliers." Like the rest of the auto industry, the convertible segment was hit hard by the global economic downturn. In Europe, convertible production fell to 338,866 units in 2009 from 475,431 in 2008, according to LMC Automotive. A rebound in 2010 and 2011 caused LMC to predict that 511,000 convertibles would be made in Europe next year, but because of the region's debt crisis some auto executives believe that forecast is too optimistic. "It's clear that buyers are very careful," Roeren said. "Convertibles are typically the second or even the third vehicle in the family." Over the past three years, Webasto, Valmet and Magna emerged as the dominant suppliers of convertible tops after a messy shakeout. Webasto, a family-owned business headquartered outside Munich, nearly exited the convertible roof business in 2009 after sales collapsed. Instead, the company decided to dominate the segment. In 2009, it purchased the convertible roof business of Edscha, which was insolvent. The following year, Webasto purchased Karmann's North American roof operation. Meanwhile, Magna Car Top Systems – which had purchased Porsche's CTS convertible subsidiary in 2005 – tried and failed to acquire Karmann's plants in Poland and Germany. European regulators blocked that deal to prevent Magna from establishing hegemony over the convertibles segment. Instead, Valmet -- a Finnish contract manufacturer -- picked up Karmann's European assets. Once the buying was done, Webasto, Magna and Valmet emerged as the major producers of convertible roofs in Europe and North America. Roeren and other executives say the industry's consolidation is likely complete. Webasto's boss also believes there is room for all three because of the different sourcing strategies the automakers have. Given the convertible segment's modest prospects, each of the suppliers has its own survival strategy. Webasto is a key player in Europe's convertible market. The company's two major launches this year are the Mini roadster and the Volkswagen Golf GT I Cabriolet. But Roeren is counting on panoramic sunroofs – not convertibles – for big sales growth. In 2000, the company installed its first panoramic sunroof in the Peugeot 806. In Europe, BMW Group and Volkswagen Group are big purchasers of Webasto's panoramic sunroofs. And in North America, Ford is the company's biggest sunroof customer. "It's a big selling feature," Roeren said. "We definitely see a strong trend in Europe from traditional sunroofs to panoramic sunroofs." While Webasto pursues sunroofs, Valmet Automotive has spent the past two years rebuilding the European roof system operations of Karmann, which had lost manpower and contracts during the company's insolvency. Michael Hannemann, Valmet's senior vice president of roof systems, said the company once again is negotiating -- and winning -- contracts for future convertible programs. "Due to the [Karmann] insolvency, we could not win new programs for a couple of years, because of the uncertainty," Hanneman said. "It takes time to convince the customers that you are really back." Currently, Valmet has convertible roof supply contract with BMW, Daimler, Renault and Volkswagen. The company opened an engineering office in Shanghai to work with Asian automakers, and this year it opened an office in Detroit. Europe, however, remains Valmet's key market, and the company has no plans at the moment to launch manufacturing operations in North America or Asia. That means Valmet's convertible roof business isn't likely to grow quickly. Unlike Webasto, Valmet does not make sunroofs. Moreover, Hanneman does not expect Europe's convertible production to top 500,000 units next year. Like Webasto and Valmet, Magna International has expanded its convertible roof business by gobbling up other companies. The Canadian megasupplier got into the segment in 2005, when it acquired Porsche's CTS convertible roof operation. After its failed 2009 bid for Karmann's bankrupt European business, Magna managed to expand its convertibles business in North America. In 2011, for example, the company began producing convertible tops for the Chevrolet Camaro. Meanwhile, sister company Magna Steyr -- a contract manufacturer based in Graz, Austria, -- is building convertible roofs for the Mercedes-Benz SLK and Fiat 500C. Like Webasto, Magna is getting into the sunroof business. This month, it announced plans to invest $10 million to produce sunroofs in a U.S. plant that it had acquired in Holland, Michigan. Although the convertible roof industry in Europe and North America is unlikely to grow much anytime soon, Webasto, Valmet and Magna can afford to be patient. Each has other businesses that it can count on for growth. And Europe's automakers appear to be pleased with a market that has consolidated down to a few suppliers. Said Valmet's Hannemann: "I think the carmakers are happy to have three innovative companies in the market. We are challenging each other."